Currently, more mergers and acquisitions are occurring in the enterprise community than ever before. The Institute for Mergers, Acquisitions & Alliances found that activity in this arena reached an all-time high last year, with more than 48,000 mergers and acquisitions taking place across the globe in 2016. Nearly 15,000 of these transactions involved North American businesses, and the monetary value of each merger continually fluctuates. Bring IT decision-makers in as early as possible: Because IT systems can represent one of the most complex parts of merger activity, it's imperative that IT leaders are involved as early as possible. As AT Kearney noted, IT employees can help pinpoint any risks and requirements early on, preventing these concerns from becoming large-scale issues later on down the line. Create a plan of attack: To ensure everyone remains on the same page, department leaders (including IT) should establish a plan for integrating systems. This strategy should encompass a baseline for IT functionality to prevent any downtime or lulls in operation. In addition, the plan should also lay out a schedule for when certain assets are migrated and integrated, and when the entire process will be completed. 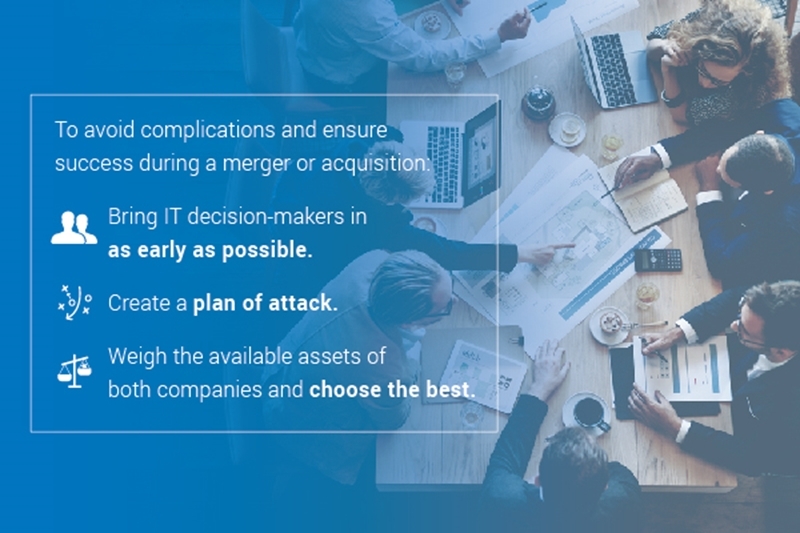 Weigh the available assets of both companies – and choose the best: A main goal of the merger should be to capitalize on the optimal IT assets from each side. Asking questions regarding which organization's infrastructure has the most free space, which has the newest equipment and software, as well as queries about current software and application licenses can help decision-makers select the best assets to incorporate in the integration, without wasting resources on unnecessary or overlapping system functionalities. In addition to these best practices, it's imperative to include performance monitoring throughout the integration process. This includes monitoring the IT environment of each business ahead of migration to get the best sense of resource usage, total available capacity and current performance benchmarks. "The merger should capitalize on the most optimal IT assets of each side." Monitoring should also continue to take place after the assets highlighted in the plan have migrated to the new infrastructure. This allows decision-makers to better plan for current resource demands, as well as future scalability requirements, helping to right-size the combined environment to support employee needs. When seeking out a performance monitoring solution to assist in the merger and acquisition process, it's best to find a tool that is cloud-based, as it enables access for all relevant stakeholders overseeing critical details about the IT environment during and after migration. Selecting a tool that allows users to virtually tag and group IT assets is also incredibly beneficial. In this way, users can track every important system and piece of equipment and prevent items from falling through the cracks during the integration process. To find out more about the critical role performance monitoring plays in M&A IT integration processes, contact the experts at Galileo today.